There are a variety of ways to determine motility of a bacterium—biochemical tests as well as microscopic analysis. If fresh culture of bacteria is available, microscopy is the most accurate way to determine bacterial motility and ‘Hanging drop method’ is a commonly used microscopic technique. Motile bacteria move about with structures called flagella (a few exceptional bacteria move with the help of axial filaments, which cannot be seen in the microscope). In semi-solid agar media, motile bacteria ‘swarm’ and give a diffuse spreading growth that is easily recognized by the naked eye. Prepare a semisolid agar medium in a test tube. Inoculate with a straight wire, making a single stab down the center of the tube to about half the depth of the medium. Incubate under the conditions favoring motility. Examine at intervals, e.g. after 6 h, and 1 and 2 days (depends on generation time of bacteria) . Freshly prepared medium containing 1% glucose can be used for motility tests on anaerobes. Results: Hold the tube up to the light and look at the stab line to determine motility. Non-motile bacteria generally give growths that are confined to the stab-line, have sharply defined margins and leave the surrounding medium clearly transparent. Motile Bacteria typically give diffuse, hazy growths that spread throughout the medium rendering it slightly opaque. 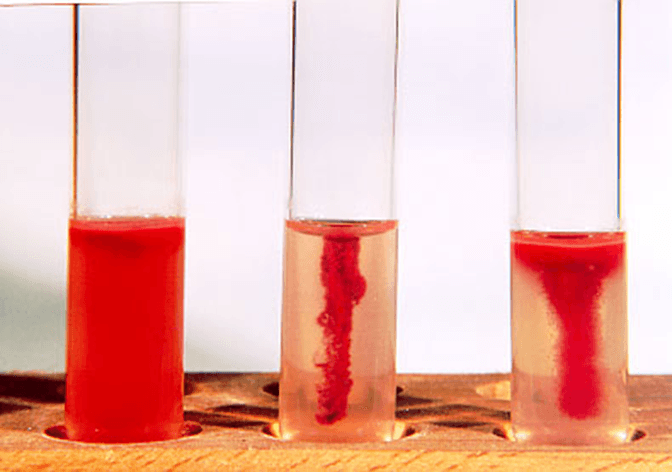 In laboratory Motility testing using semi-solid medium is commonly used for the identification of gram negative bacteria of Enterobacteriaceae family. Motility testing is done in conjunction with other biochemical testing using special bio-chemical media. Sulfide Indole Motility (SIM) Medium: It is a semisolid agar used to determine hydrogen sulfide (H2S) production, indole formation, and motility. Motility Indole urease (MIU) test: It is used to determine Motility, indole formation and Urease Test. Motility test is also used for the species differentiation of gram positive cocci, Enterococci. Enterococcus faecium and E. faecalis are non-motile, whereas E. gallinarum and E. casseliflavus/E. flavescens generally are motile. Incorporation of tetrazolium chloride at a final concentration of 0.005% in the medium is helpful. The tetrazolium makes the motility agar much easier to read for motility. Tetrazolium is colourless in oxidized form, but the reduced salt is red (occurring as a result of bacterial metabolism) and indicates where bacterial growth has occurred. Distilled water motility test: It is a simple and very useful test to differentiate Vibrio species (gram negative motile curve rod) and Aeromonas species (gram negative motile rod). Aeromonas species will grow on MacConkey agar and sometimes on TCBS, producing yellow colonies. Both of them are oxidase positive. Mix a loopful of growth from a nutrient agar subculture in a drop of sterile distilled water on one end of a slide. On the other end of the slide, mix another loopful of growth in a drop of peptone water. Cover each preparation with a cover glass. Examine microscopically using the 40 objective. Results: All Vibrio species are immobilized in distilled water but remain motile in peptone water. Aeromonas species remain motile in distilled water and peptone water. Please could you let me know if it possible for one to use the picture you have for showing motility testing in semi solid agar? Please can the motility test using sterile distilled water and peptone also be used for pseudomomas species?